Cook rhubarb, 1 cup sugar and the orange juice in 2-quart saucepan over medium heat 15 to 17 minutes, stirring occasionally, until rhubarb is very tender and mixture is thick and syrupy. Cool 25 minutes or until room temperature. Fold in strawberries. Heat oven to 375°F. Grease cookie sheet. Mix 1 tablespoon sugar and the orange peel in small bowl. Unroll crescent dough; press perforations to seal. Sprinkle with sugar-orange peel mixture. Starting at short side of rectangle, roll up dough; seal edges. Cut roll crosswise into 6 slices; place cut side down on cookie sheet. Sprinkle evenly with 1 teaspoon sugar. Bake 13 to 17 minutes or until golden brown. Cool 10 minutes. Meanwhile, beat whipping cream in chilled small bowl with electric mixer on high speed until soft peaks form. 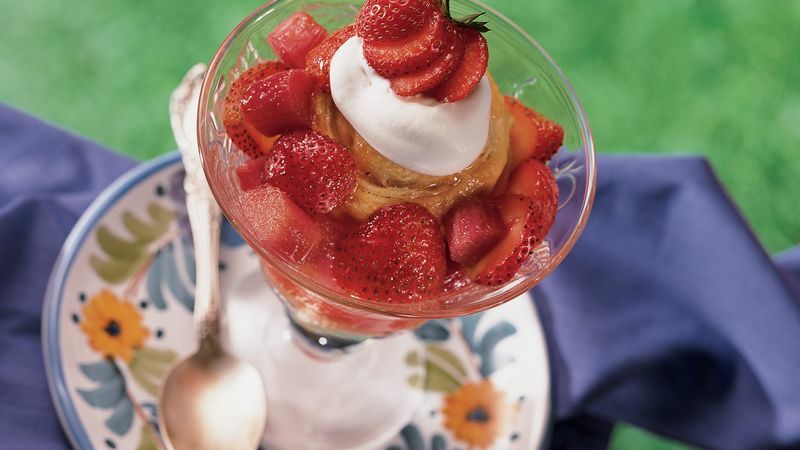 To serve, place shortcakes in individual dessert bowls. Spoon strawberry-rhubarb topping over shortcakes. Top with whipped cream. Grate the orange peel from the whole orange before cutting it and squeezing out the juice. Be careful not to grate into the white part, or pith, because it's bitter. Medium-size rhubarb stalks are generally more tender than large ones, which may be stringy. The deeper the red, the more flavorful the rhubarb stalks are likely to be.